Finally, some health food! Oh, you knew I was going to say that. I do have a modification in mind, however. Have never advocated diluting pure sweetness with a competing taste. Ergo, lose the coconut. That may be somewhat related to your choice of unsweetened coconut, methinks, but I say who needs coconut to begin with? Coconut (sweetened) is good on something that otherwise is not sweet – like fried shrimp. And again, this cake should be eaten in a saucer with milk over it in order to control each spoonful according to the ratio of neutralizer (milk) to sugar (mostly frosting) and texture (cake). Sully, too funny about the "health food: -- you should have been there back in the day when I really health-fooded everything up; this would have been made with whole wheat flour and maybe a little wheat germ! Now this is indeed one of my all-time favourite cakes! And I haven't made one in ages. You realize now that I will be craving it and will have to bake one! Oh my, I can just taste it with a cup of tea. Thanks for sharing your recipe. I have never made a sheet cake with the German icing but I will give it a go. Enjoy your day and thanks for joining me for tea. I'm so like you, Jean, in loving to use my toaster oven. I must try this cake recipe! When I saw the picture of it, I just said, "mmmmm"! Oh,,I wish we were neighbors, for I'd be right over to taste that yummy cake. Thank you for your visit to my blog and your lovely comment. Sandi, I think most people "haven't made one in ages." Grease and flour three pans, whip egg whites, etc. Who has time? Hope you'll like my shortcut! Oh, Kitty, I don't know how I managed all those years without a toaster oven! :D Especially on hot days, I just love it. Tea and cake, mmmmm. Ah well, the neighbours will eat it right up. After I'm done with it! You got me with coconut and pecan! What a great idea. That's thinking outside the box (oven)! I'm looking forward to my butternut squash getting fully ripe so I can make butternut squash soup and bake a hearty brown bread to go with it. Of course, that will be on a cold fall night. Wish I had a piece of that cake right now! What a beautiful cake! Children would love it too. Anybody would love it! Jacqueline, do let me know how it turns out for you and whether or not you were able to coax the GS to give it a go! Thanks, Judy! And thanks for reminding me about butternut squash soup -- I want to make a big pot of it just as soon as fall "falls"! Bernideen, thank you! It's so good with a cold glass of milk OR a nice hot cup of English breakfast tea. 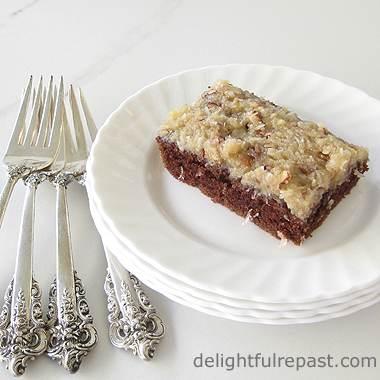 This reminds me of German chocolate cake. That coconuty frosting is heavenly! Yes, Angie, I could just eat that frosting by the spoonful, no cake necessary! I bet that frosting does taste delicious. Thanks, Margaret! What I like about it is that the unsweetened coconut makes it not so sickeningly sweet as the usual. Looks delicious I need to try this frosting, Pinning and tweeting to keep it in my file. Swathi, thank you! I think you'll like it! Those forks, Jean, look amazing. Do you have a full cutlery set? ANY sort of chocolate cake is fine with me. I had a lovely chunk of chocolate fudge cake recently. It was baked by a farmers wife in The Yorkshire Dales. Myself and two friends sat in her kitchen garden overlooking her flock of prize sheep, drinking a pint mug of hot Yorkshire tea and eating her heavenly chocolate fudge cake. I didn't know you could bake a cake in the toaster oven!?! Looks so yummy. I love anything with coconut! Yes! You should look up my toaster oven (there's a link) and read about it. My friend has a toaster oven that's so tiny you couldn't bake this cake in it. I think mine is the perfect size to be really useful through the hot weather. Your Cake looks amazing, Jean, and I love the frosting! I'm looking forward to autumn baking with pears and apples! Thank you so much for sharing with us at Hearth and Soul. Pinned and shared your recipe. April, thank you! So appreciate your pinning and sharing! I too am looking forward to an autumn of pears and apples. Last couple of years I neglected pears, but not this time. saw this on creative k kids tasty tuesday link up - this looks AMAZING! 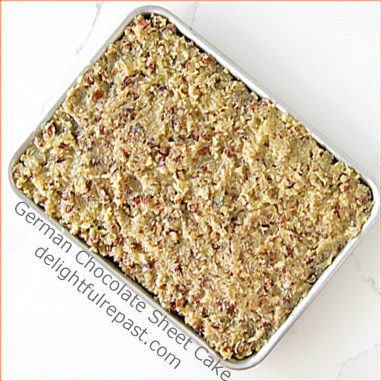 and easier than the german chocolate cake i attempted one time :) pinning on my "recipes to try" board for next time i need a german chocolate cake.... which is probably pretty soon! yum! Renee, thank you so much! And thank you for telling me how you found Delightful Repast. It's always good to know, but most of us rarely think to mention it. Let me know how it turns out for you. This is one of those cakes I know ahead of time I'd eat more than my share and probably more than your share as well. I just love this! Tandy, thanks! It is one of my favorites, and I don't even really like chocolate! Thank you so much, creativelyhomespun! I'm with you regarding simplicity in the kitchen. Such a wonderful looking cake, and made in the toaster oven! Thank you, Sara! I'm trying to simplify in other areas of my life as well, and I'm loving it!